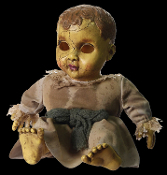 This creepy antique inspired realistic doll features the face of a spooky doll with no eyes and fake cracks for that well-worn look. Scary looking ‘‘toy’’ dolly makes a spooktacular Halloween haunted house prop. Add a glow stick in the hollow head behind the eyes for extra creepiness! Speaks in an innocent childlike voice with nursery type music in the background. *We added a glow stick inside her head so the eyes glow... Extra scary!! !